Microsoft today announced a brand new color option and bundle for those looking to pick up an Xbox One X console (or another one, for those big spenders and/or superfans). Beginning today, pre-orders for the Xbox One X Robot White Special Edition Fallout 76 bundle are now live. 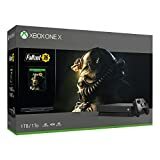 The $499.99 bundle will be available on November 14th and include a white Xbox One X with a 1TB HDD, a matching controller and a full-game download of Fallout 76 along with free trials of Xbox Live Gold and Xbox Game Pass. They will also be offering up a White Special Edition Xbox Elite wireless controller too for $149.99 on October 8th, 2018. See a trailer for that below. Last but not least, there will be an officially licensed Turtle Beach Elite Pro 2 + SuperAmp Pro Performance Gaming Audio System headset, also in white, for $249.99. It’ll be made available on September 16th, 2018 in North America.